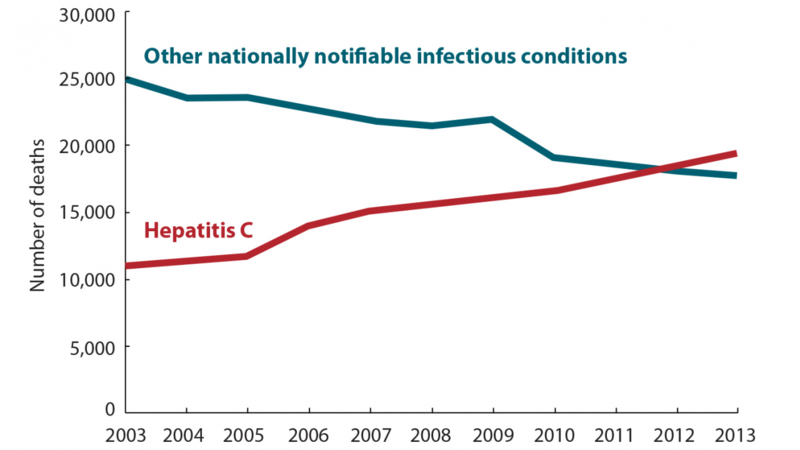 More people now die from hepatitis C in the United States than 60 other infectious diseases—including HIV and tuberculosis—combined. Two new reports from the U.S. Centers for Disease Control and Prevention analyze hepatitis C disease and death. The virus now infects and estimated 3.5 million Americans, and in 2014, it killed 19,659. That’s the highest number of people in the country to die from this liver-damaging disease, CNN reports. Hepatitis C virus still infects about 30,000 Americans a year and primarily is spread by injecting drug use. New drugs can cure most hepatitis C infections in 12 weeks, but half the infected people in the United States do not know they are living with the virus.